Samsung's Galaxy S3 Android smartphone will be released in the U.S. on June 1 through Amazon for $800, and it's available today in Dubai. Reports are coming in from Dubai that the international version of the Samsung Galaxy S3, known as the GT-i9300, is being sold today, although it's unknown whether Dubai retailers have broken the street date of the phone or their release is simply early. Samsung declined TechRadar's request for comment on this question. 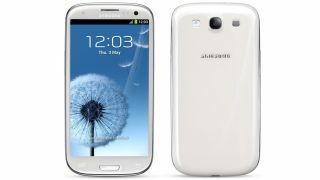 U.K. carrier Vodafone revealed today that the Samsung Galaxy S3 is the "most pre-ordered Android device" yet, and U.S. customers can pre-order it now on Amazon. But while it's tempting to grab it as soon as possible, it may be more prudent to hold out a bit. To buy or to wait? Holding Samsung's Galaxy S3 in your hands at the beginning of next month would be some intense instant gratification, but it may be smarter to wait in this case for a release through U.S. carriers. Buying the GT-i9300 on June 1 will set you back $800, for one thing, although reports from Dubai indicate that the phone is being sold there between $666 and $680. Either way, when the Samsung Galaxy S3 releases through U.S. carriers it will likely be significantly cheaper with a contract. The international version comes SIM-free and with 16GB of memory, and it will almost certainly have at least one advantage over the eventual carrier-specific release of the Galaxy S3: the quad-core 1.4 GHz Exynos processor. The processor is not compatible with 4G LTE, so you'll potentially trade faster data connection for that extra oomph. The international Samsung Galaxy S3 will be compatible with AT&T's HSPA+ network, and it will be able to make calls on T-Mobile, though incompatibility with T-Mobile's 1700MHZ band means no high-speed data on that carrier. The GT-i9300 won't be compatible with Sprint or Verizon. The U.S. carrier-specific version is expected to trade the quad-core 1.4 GHz Exynos chip for a dual-core option, though the phone's other specs, including the 4.8-inch display, 1GB of RAM, 8MP camera, and Ice Cream Sandwich OS (as well as Samsung's suite of extra software) will likely remain in place. Samsung declined TechRadar's request for further comments regarding the Galaxy S3's release.